I received my pdf copy of Internet Genealogy magazine today. 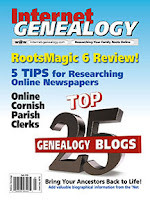 The featured article in the June-July issue is the selection of the Top 25 Genealogy Blogs. Seeing is believing (see below). To say this was completely unexpected would be an understatement. When Bill West of West In New England sent out the news via Facebook I had to ask if he had read the article properly. He said he had. I was surprised, as there are so many more deserving bloggers out there. I will gratefully accept the award to Shades Of The Departed. The new Shades Of The Departed Magazine appeared the same day as the award and I owe a debt to so many for sticking with me and making the magazine a success. The next two magazines are in the works along with other Shades improvements. 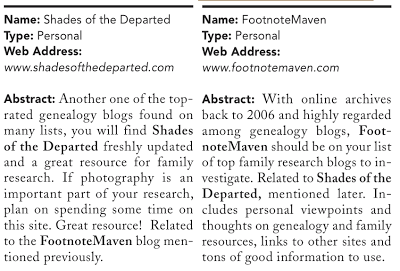 So, thank you very much Internet Genealogy magazine, I accept this as an advance on work to come. But Maven? Well, she has become a cranky cat lady on Facebook. FootnoteMaven the blog has been forsaken for an all out assault on regaining my health. Will she ever be back. Of course; but does she deserve this lovely award. Absolutely not. So I'm giving fM's award to all those Genealogy Blogs that deserve the recognition for years of consistent hard work and to all the rising stars who've decided to dive in. In essence, to the entire Genealogy Blogging Community. Well deserved. I wish more of these awards were the result of reader polls. This type of award was done once. In that award the bloggers in the running were selected by the readers and judged by a group of well-respected genealogy bloggers. I am very proud of that award, as it is the readers and my fellow bloggers to whom the credit is due. 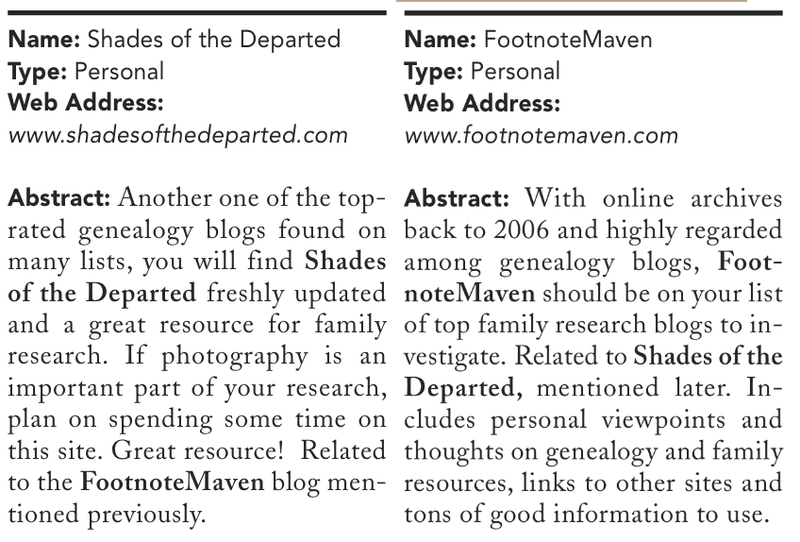 Thank you to Tom Bandy of Internet Genealogy magazine, the author who made the selections! It has been pointed out to me that the award was for my body of work, not for the body that hasn't worked. So an extra thank you. I warned you I'm cranky. Congrats on being listed in the top 25 Genealogy Blogs! for work past and work yet to come! We salute you, fM!